Laravel 5.7 has just been released! What's new? What improvements were made? Learn how to build better PHP applications with this new release. TL;DR: Laravel 5.7 is a major release to, at time of writing, the most popular PHP framework on GitHub. Furthermore, Laravel Nova was also released. In this article, I'll cover the new features in Laravel 5.7 and several other changes and deprecations. What's new in Laravel 5.7? Marcel Pociot, authored a package called laravel-dump-server. This package provides you a dump server, that collects all your dump call outputs. It's inspired by Symfony's Var-Dump Server. All dump calls will be displayed in the console window once the server has started. Laravel 5.7 provides a better approach for testing artisan commands. * Test a console command. "Laravel 5.7 provides a better approach for testing artisan commands." In Laravel 5.7, you can now send notifications in other locales, apart from the current language. The Illuminate\Notifications\Notification class offers a locale method that can be invoked to set the preferred language. By default, Laravel provides three links on each side of the primary paginator links. In Laravel 5.7, there's a new option, onEachSide, to enable customization of the number of links displayed on both sides. By default, authorization gates and policies return false for guest visitors to your application. In this new release, you can now allow unauthenticated visitors to pass through authorization checks by declaring an "optional" type-hint or supplying a null default value for the user argument. Laravel 5.7 provides an optional email verification feature. An email_verified_at timestamp column has to be added to the user's table migration for this feature to work as intended. If you want new users to verify their email, the User model needs to implement the MustVerfifyEmail interface. The newly registered users will receive an email containing a signed verification link. Once the user clicks the link, the app will automatically update the database and redirect the user to the intended location. This feature also ships with a verified middleware for situations where you need to protect certain app routes from only verified members. Joseph Silber submitted a PR that allows Laravel 5.7 to provide a clear and concise message when a non-existent method is called on a model. Laravel 5.7 now supports callable array syntax for controller actions that generate URLs. Taylor already announced that he was working on a project several months ago. The long awaited project called Laravel Nova has been released. Nova is a beautifully designed administration panel for Laravel. It offers support for filters, lenses, actions, queued actions, metrics, authorization, custom tools, custom cards, custom fields, etc. "As if Laravel 5.7 wasn't enough, @taylorotwell formally introduced @laravel_nova, a beautifully designed administration panel for Laravel." The resources/assets directory has been flattened into resources. Check out other Laravel 5.7 updates on GitHub. Laravel 5.7 requires PHP >= 7.1.3. And the estimated upgrade time from Laravel v5.6 is about ten to fifteen minutes. Check out this comprehensive upgrade guide. However, if you don't want to be bothered about manually configuring and changing files for the upgrade, I recommend using Laravel Shift - A service that provides automated, instant Laravel upgrade services by an army of thorough bots and friendly humans. You'll need an Auth0 account to manage authentication. You can sign up for a free account here. Next, set up an Auth0 API. Go to APIs in your Auth0 dashboard and click on the "Create API" button. Enter a name for the API. Set the Identifier to a URL(existent or non-existent URL). The Signing Algorithm should be RS256. 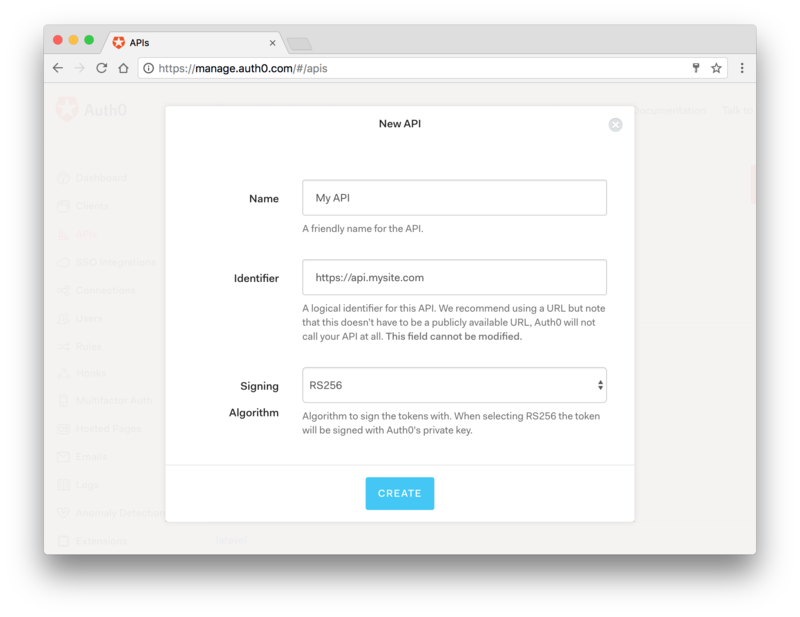 We're now ready to implement Auth0 authentication on our Laravel backend API. After the file is generated, it will be located at config/laravel-auth0.php. Ensure you replace the placeholder values with the authentic values from the Auth0 Admin Dashboard. Double check your values with laravel-auth0. The laravel-auth0 package comes with a provder called LoginServiceProvider. Add this to the list of application providers. If you would like to use the Auth0 Facade, add it to the list of aliases. The user information can now be accessed with Auth0::getUser(). Finally, you need to bind a class that provides a user (your app model user) each time the user is logged in or an access_token is decoded. You can use the Auth0UserRepository provided by this package or you can build your own class. The laravel-auth0 package comes with an authentication driver called auth0. This driver defines a user structure that wraps the normalized user profile defined by Auth0. It doesn't actually persist the object but rather simply stores it in the session for future calls. This is adequate for basic testing or if you don't have a requirement to persist the user. At any point you can call Auth::check() to determine if there is a user logged in and Auth::user() to retreive the wrapper with the user information. Configure the driver in config/auth.php to use auth0. Your API routes are defined in routes/api.php for Laravel 5.3+ apps. | is assigned the "api" middleware group. Enjoy building your API! Now, you can send a request to your protected endpoint which includes an access_token. Once a user hits the api/wakanda endpoint, a valid JWT access_token will be required before the resource can be released. With this in place, private routes can be secured. Laravel 5.7 PHP framework came loaded with new features and significant improvements. And Nova is a product every Laravel developer should try out! "Laravel 5.7 has been released! Learn what's new in the most popular PHP framework"